To put it in a simple way, by saying e-learning we mean a lesson that is delivered using a computer. This lesson or course uses electronic technologies to deliver it, and it can be anything from a simple lesson or part of it, mandatory training for business or a full distance learning university degree. Also, the students and teachers are not in a classroom, actually they can be anywhere in the world and still be able to share the same knowledge. 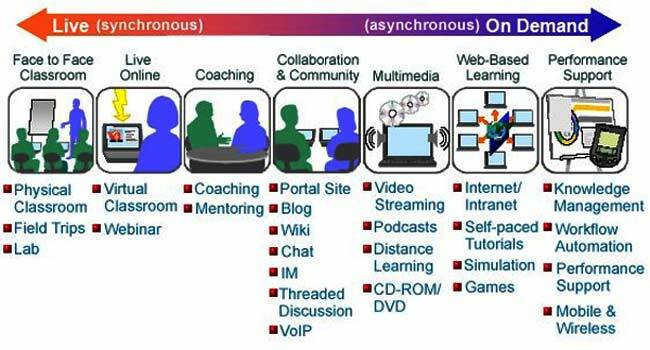 In general, there are two main types of e-learning, Synchronous training and Asynchronous training. Synchronous e-learning training means that, although the participants (i.e. the students or learners) and the instructor (i.e. the teacher or professor) are not located at the same place, they do gather, however, at the same time online and interact through the internet. More or less, it is like being in a classroom, but the difference is that the participants can be anywhere in the world, provided that they meet online at the same time. With asynchronous e-learning training the participants in an online course study at their own pace. The instructor does not interact with them in real time (live). Usually they have a time table to complete their training and interact with the instructor and other students with e-mails, web boards and other online media. Each one of these methods, has its own advantages and disadvantages, and depends on the individual person which one of them is the most suitable, based on character and individual circumstances. For example, for someone working on flexible hours, the flexibility offered by the asynchronous e-learning method to access the lesson from anywhere at anytime will be a great plus. Finally, there is a way that conbines these two types. The learners study on their own pace and time, but from time to time they have online live sessions with their instructors and classmates. In order to be able to watch these online lessons, special software was created, called e-learning platforms. In today's world, these platforms can offer many different services. As the technology is developing, e-learning platforms offer a very broad array of means to help instructors deliver successfully their lessons. We call these e-learning platforms Learning Management Systems (LMS).